A flotilla is determined to sail to the Gaza Strip this weekend in breach of Israel's naval blockade on the Hamas-controlled territory. This decision comes in spite of growing international pressure to stop the campaign, damaged ships and fewer passengers than expected. 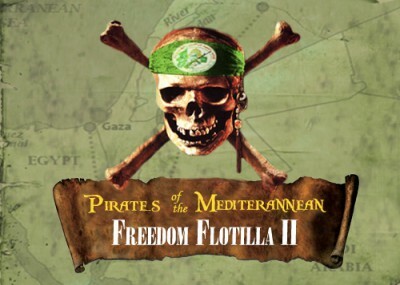 The United Nations, United States, European Union, Britain, Canada, Greece, France, the Organization of Islamic Conference (OIC) and Israel have called on organizers of Freedom Flotilla II to abandon their plans in an effort to avoid a repeat of the violent confrontation between Israeli commandos and activists of the first Freedom Flotilla on May 31, 2010. That encounter claimed the lives of nine passengers and injured nine Israeli soldiers, causing international outcry and tensions between Turkey and Israel. Last year's flotilla was comprised of six ships, organized by a coalition of international organizations, including the Islamist Turkish organization IHH. IHH has extensive ties to Hamas and is under consideration for designation by the U.S. State Department. Leaders of the IHH-owned Mavi Marmara ship launched a premeditated attack on Israeli commandos last May when the Israeli Navy attempted to intercept the ship before it reached Gaza. Israeli commandos boarded the Mavi Marmara following repeated warnings, and were immediately attacked by activists wielding clubs, knives, axes, hammers and other weapons. IHH was gearing up to participate in the second flotilla, but announced earlier this month that the Mavi Marmara would not sail. IHH leader Bulent Yildirim cited "technical problems" as the reason for withdrawing. Other sources say pressure on Turkey from the United States government led to IHH's decision. Although IHH is no longer officially involved, some of its members plan to sail on other ships. The Israeli Navy is preparing for various scenarios, including the possibility of "extreme violence" from flotilla participants. The Israeli Defense Forces (IDF) claimed Monday that some flotilla participants said their intentions are to "murder" and "spill the blood" of IDF soldiers. Others have prepared sacks of sulfur, which according to the IDF, is a chemical that can be used to paralyze and burn a victim to death. Israeli officials said Tuesday that radical Islamist activists were intermingling with nonviolent passengers, which creates "special operational challenges for the IDF." Senior Israeli officials have also identified two activists with known ties to Hamas who will participate in the flotilla. Intelligence received by Israel late Monday further suggests that extremists will be among passengers on the U.S.-flagged ship in the flotilla. The U.S. ship, The Audacity of Hope, plans to sail with close to 50 U.S. citizens, including media personnel, in defiance of repeated calls from the State Department to abort its plans. Including the U.S. boat, Freedom Flotilla II will consist of up to 10 ships with close to 350 participants from at least fourteen countries, such as Canada, Britain, Spain, France, Germany, Sweden, Greece and Holland. The boats are leaving from various ports and plan to meet in the Libyan Gulf before proceeding to Gaza, according to a Greek organizer. Many of the boats, including the U.S. ship, are already docked in Greece, but have been blocked from sailing by Greek authorities. Flotilla organizers are experiencing setbacks, as some ships may be declared unfit to sail. It is also possible that the Greek government will withhold a departure authorization, according to the Israeli news outlet Ynet. Organizers in Greece said Tuesday that their departure may be postponed until next week. In the meantime, Israel is continuing talks with European leaders and American Senators to try to have the entire flotilla cancelled. Organizers said in a statement Monday that their effort is not "simply about increasing humanitarian aid to Gaza. It is about freedom for Palestinians in Gaza and the rest of the occupied Palestinian territories." But only two out of the ten boats in the upcoming flotilla are cargo ships carrying aid, raising questions about whether the flotilla has humanitarian motives at all. Last month, Egypt opened the Rafah border crossing with Gaza, increasing the flow of goods into the territory. The opening of the Rafah crossing ended a four-year land blockade of Gaza jointly imposed by Egypt and Israel after Hamas' forceful takeover of the area in 2007. The blockade was intended to limit the access of rockets and other war materials into Gaza that could be used against Israeli civilians. Israel's naval blockade was not implemented until 2009 when Israel launched Operation Cast Lead in response to continued rocket fire from Gaza. Israel has maintained corridors for the transfer of humanitarian aid and other goods into the region. In April, the deputy head of the Red Cross in Gaza, Mathilde Redmatn, confirmed the effectiveness of these routes when stating, "There is no humanitarian crisis in Gaza." Israeli Cabinet Ministers voted Monday in favor of an Israeli Navy plan to stop the flotilla from reaching Gaza. That same day, Israel and Egypt agreed flotilla ships could unload their cargo at the Egyptian El-Arish port. Cargo unloaded at either El-Arish or at the Israeli port of Ashdod will be inspected and transferred by land to Gaza. However, ships that attempt to reach Gaza will be stopped and participants arrested. The main organizers of this year's flotilla include the Free Gaza Movement (FGM), the European Campaign to end the Siege on Gaza (ECESG) and The International Committee to Break the Siege on Gaza (ICBSG). All these organizations also played leading roles in the first flotilla. Founded in 2006 with the goal of breaking "the siege of Gaza," the Free Gaza Movement was created by senior members of the International Solidarity Movement (ISM), who continue to occupy leadership positions within FGM. ISM is a radical world-wide network of anti-Israel activists "committed to resisting the Israeli apartheid in Palestine by using nonviolent, direct-action methods and principles," and it "aims to support and strengthen the Palestinian popular resistance." According to a report from The Meir Amit Intelligence and Terrorism Information Center, ISM activists served as human shields for terrorist operatives and provided terrorists and their families with financial, logistical and moral support during the Second Intifada. Today, ISM volunteers are active in the Gaza Strip, hinder IDF counterterrorism operations and engage in anti-Israel protests worldwide in an effort to delegitimize Israel. Huwaida Arraf, one of the founders of ISM and a leader of FGM, played an active role in organizing the upcoming flotilla and will sail on the U.S. boat. Arraf recently said that there would be no weapons aboard the ships, but activists are being trained to use "different tactics" in order "to keep the soldiers off our boat nonviolently." In a 2002 article, Arraf and her husband, co-founder of ISM Adam Shaprio, wrote, "The Palestinian resistance must take on a variety of characteristics – both nonviolent and violent." They also claimed that an act of non-violent resistance is "[n]o less of a jihad. This is no less noble than carrying out a suicide operation. And we are certain that if these men were killed during such an action, they would be considered shaheed Allah." Other ISM and FGM activists are passengers on the U.S. boat, organized by a group called The U.S. Boat to Gaza. Greta Berlin, another founder of FGM and a passenger on the U.S.-flagged Audacity of Hope, helped FGM organize the first Freedom Flotilla. A long time anti-Israel activist, Berlin said in a July 2010 interview, "Israelis think everyone is a terrorist, because that's how they got their country originally." She added, "What right do they [Israel] have to collectively punish a population of 1.5 million Palestinians for resisting occupation and for voting in one of the fairest elections held in the Middle East?" ECESG is a radical umbrella group of dozens of anti-Israel and pro-Hamas organizations in Europe. A founder and ECESG leader, Amin Abou Rashed, was previously a member of the Al-Aqsa Foundation in Holland, which was shut down by the Dutch government for financing terror. The Al Aqsa Foundation and all of its branches were designated as terrorist entities by the U.S. Treasury in 2003. Rashed, who was on the Mavi Marmara ship last May and plans to sail in the upcoming flotilla, has been called a top Hamas official in the Netherlands. A Dutch report called him the "brain" behind the flotilla, saying he allegedly organized the majority of the funding for the campaign. Similarly, ICBSG is headed by former high ranking Hamas operative Mohammad Sawalha, who now resides in the UK. According to U.S. court documents, Sawalha instructed Hamas terrorists Muhammad Salah and Mohammed Abu Marzook on "Hamas-related activities" in the early 1990's. ICBSG has partnered with Viva Palestina, a UK group which has delivered millions of dollars to Hamas through land convoys to Gaza. Sawalha was instrumental in planning last year's Freedom Flotilla, and recently declared in an interview, "Now the Israelis have to understand that their policies and crimes will not make us turn away and go back. We will continue under any circumstances until we break the siege on Gaza." Several reports indicate that a Jordanian ship with radical ties also plans to participate in the flotilla. The ship was purchased by the Jordanian Lifeline Committee (JLC), headed by Wael Sakka. Sakka is the former president of the Jordanian Engineers Association, a group connected to the Muslim Brotherhood (MB) in Jordan. Sakka headed the Jordanian delegation on last year's Mavi Marmara ship, which included MB activists. JLC also participated in Viva Palestina convoys to Gaza. The Jordanian ship is expected to carry up to 200 people from Arab countries, including members of Islamic Movements. Hamas leaders have repeatedly supported the efforts of the upcoming flotilla, calling for international protection of the ships. Hamas Prime Minister Ismail Haniyeh recently declared, "No doubt the occupation is preparing for a crime similar to the first, but this time it should not go without punishment." He added, "This time the flotilla must come to Gaza and we are ready to receive it." Flotilla leaders' ties to Hamas and other radical groups indicate that the latest operation is not a humanitarian effort to support the Palestinians in Gaza. Rather, the flotilla aims to delegitimize the State of Israel, with some participants ready to confront the State violently. The flotilla organizers have stated that the aim of this flotilla is not to deliver aid, but to create a media happening that will generate PR (I paraphrase Adam (putz) Shapiro speaking to the press 10 days ago). These people love Hamas and think Hamas carries forward the glorious revolutionary essence of the Paris Commune. These are True Believers who will use any lie to advance their cause.